The Etana came into existence as one of numerous secret projects under Tibus Heth's rule. As part of those revolutionary and paranoid times in the Caldari State, political emphasis on technological research was split between a need for inexpensive improvements in warfare and a need for advances in espionage and the arts of secrecy. One of the outcomes of that research was an improvement on the Osprey, whose versatility and low manufacturing cost made it a natural candidate for improvements. The resulting vessel maintained the shield defenses known among similar ships of its type, while adding an array of remarkable black ops capabilities. 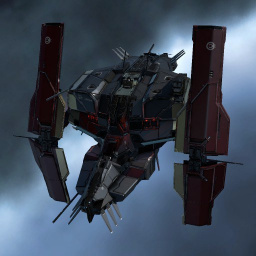 In fact, it is reputed that initial prototypes were employed to spy on interstellar activities near the recaptured Caldari Prime, as part of Tibus Heth's continually growing espionage initiative. Along with the Cambion, Etana was awarded as one of the prizes for the tenth Alliance Tournament. The Etana is essentially a Basilisk that's able to fit a covert ops cloak. It would be a very powerful accompaniment to any black ops gang, however its pricelessness means it will likely very rarely be seen in action. Further information about additional or recommended skills to pilot Etana for a specific or it's common role(s) can be written here. No tagged fittings for Etana. No sub-article about Etana roles or piloting tactics. You can write them here. You can write additional notes for Etana here. This page was last modified on 5 February 2017, at 21:34. This page has been accessed 44,777 times.